I went to visit Ruggero Castellani in his workshop “Chiodofisso” in Dueville, near Vicenza, an obligatory stop for all lovers of the ukulele and especially of the banjolele. It was the fourth time I had met Ruggero, with each time offering the great thrill of chatting with him whilst trying out the instruments that are always so fascinating, having been selected and restored with care. This time was also an opportunity to discover new aspects of these sound objects together, far from us in time and space, that tell us tales worthy of being rediscovered. Ruggero is very curious about all that happens in the world of the ukulele and knowing my interests well, he suggested that I check out certain books and magazines that he bought between one banjolele and another over the years, perhaps forgotten in a dusty case. Having read my recent article, BEYOND G C E A, he thought it was important to make me aware of what was written in some of these booklets, knowing that this would allow me to continue my research into the different ukulele tunings in England and the United States. 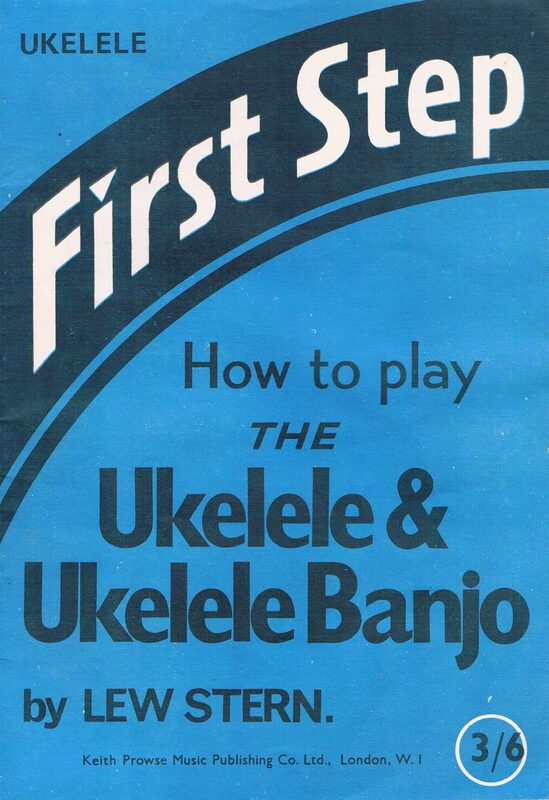 The first booklet I want to talk about is titled “The First Step – How to Play the Ukulele and Ukulele Banjo”, written by Lew Stern and published in 1927. It explains to beginners how to achieve the accompaniment of simple songs on an instrument tuned in D, being A D F# B. After providing precise and helpful instructions on strumming on songs in tones of Re and Sol, using the chord forms we know as C F G7 C7 Am Bb, he added that once you learn these left-hand positions, you can play songs in more difficult tones such as Eb and Ab simply by raising the tuning by half a step. Similarly, by lowering the tuning by a step, you can play tracks in C and F using the same chord positions. The same instrument, usually tuned in D, could thus be a “scordatura” in C or Eb. 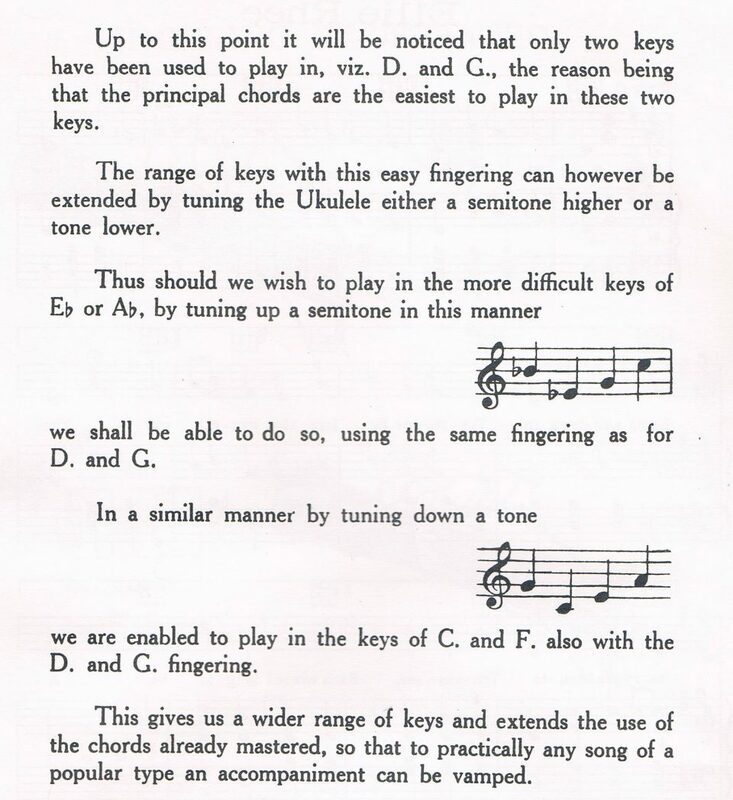 It is thus certain that in the decades during which it was considered that the standard tuning was in D, the possibility of playing with alternative tunings according to needs was not excluded, with that in C and Eb being suggested for obvious reasons of practicality. 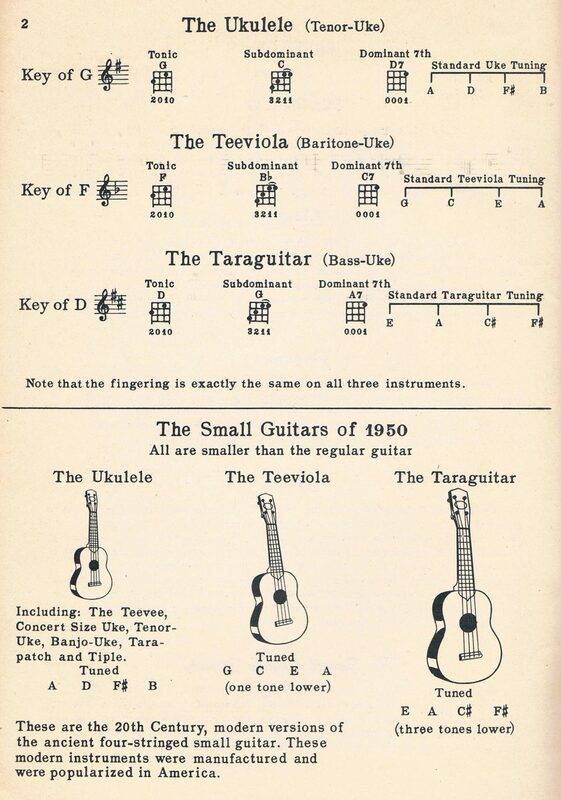 The collection of songs entitled “Famous Collection Arranged by Wendell Hall” published in 1950 is also dedicated to the ukulele in D, with an interesting classification. Wendell Hall uses some unusual terms to define the instruments that comprise “the family of small guitars”: Ukulele – Teeviola – Taraguitar. Each was tuned differently: in D (a d f# b), in C (g c e a), in A (e a c# f#). Leaving aside the use of these terms that certainly did not take hold, what is clear is the intention to classify them according to the register (tenor, baritone and bass) and the three tunings that unequivocally broaden the sound spectrum of the 4-string instruments deriving from the guitar. In this case, the tuning of the instrument is not altered to play in other tones but uses different instruments already tuned in different ways. Considering that both of these volumes are destined to the accompaniment of the song, we can easily assume that these “scordatura” are functional as they adapt to the different vocal registers of the singer. All this confirms what has already been stated in concluding my previous piece entitled BEYOND GCEA. The potential of the ukulele is exponential and it is a shame that we often limit ourselves to standard tuning, whatever that may be. The multiple dimensions of the soundboard and the different diapason of the ukulele that we play could be better exploited to highlight the various registers, in particular soprano contralto and tenor that, in practice today, are flattened by the GCEA tuning. We could instead take a cue from the experience of certain ukulelists of the past, although there are also interesting examples even today. For those wishing to have a more precise idea of ​​how to play the other tunings, I recommend listening to the episode of AROUND THE UKULELE no. 38 of 31st January 2018 in which you can listen, amongst others, to Cliff Edwards, John Butler and our Fabio KoRyu Calabrò. Until next time.